Most Kenyans rely on Matatus, informal microbuses, to get around (Photo: Nov. 4, 2003, Nairobi, Marco Longari/AFP-Getty Images). At the beginning of February, chaos erupted on Kenya’s roads. All over the country, traffic came to a standstill, with drivers venting their frustration by jamming fists down on horns. To bypass the gridlock, some vehicles drove over curbs or sped down the wrong side of the road. The cause was a new law announced by the National Rainbow Coalition (NARC) government—a bold attempt to tame a transportation sector that for many years had been subject to abuse and criminal activity. The government was particularly targeting the vehicles known as matatus—usually 24-seater vans and 32-seater omnibuses owned by individuals. Often emblazoned with colorful names like “Uprising” and “The House of Pain,” matatus have traditionally been responsible for ferrying 12 million commuters in Kenya to and from work every day. Notorious for overloading, overcharging, speeding, disobeying traffic laws, using unroadworthy vehicles, and verbally abusing passengers, matatu drivers have accounted for many of the 3,000 deaths and tens of thousands of injuries on Kenya’s roads each year. Most routes have been controlled by mafia-style cartels, which appointed drivers and imposed arbitrary fare hikes, and to which vehicle owners typically paid hefty tolls. “The rebels who own these vehicles should be made aware that there is no profit so valuable that it can be placed above public safety and no enterprise so hallowed to be above the law,” editorialized the East African Standard (Feb. 1). In October 2003, Minister of Transport and Communications John Michuki announced that all public-service vehicles (PSVs) had to be fitted with speed governors (a gadget fitted in the engine to ensure that the vehicle does not exceed the speed limit of 80 kph/49.7 mph) and safety belts by Jan. 31. Additionally, PSV drivers and conductors were required to wear badges and uniforms, and to be permanent employees with a monthly salary. Owners had to paint a yellow band on their vehicles and prominently post the vehicle’s ownership and routes; passengers were warned that it was an offense not to use safety belts. In Nairobi, only 3,000 of 14,000 matatus passed mandatory inspection by the Transport Licensing Board during the first few weeks of the operation, forcing commuters to bring their cars onto the roads or walk long distances to work. Writing in the Daily Nation (Feb. 23), Wilson Macharia was troubled by the fact that matatus would no longer be able to offer low fare rates to passengers who were crammed in at the last minute, thereby increasing an economic toll on low-income Kenyans. “If we rush to make far-reaching reforms in sectors that give essential services, we will end up hurting the very people we meant to assist,” he wrote. But despite the chaos, most Kenyans supported a move that would curb crime and increase road safety. “Commuters have realized that the long-term benefits of the government’s radical rein-in of the rogue matatu subsector to restore order far outweigh the immediate costs and current dilemma facing them,” read an editorial in People Daily (Feb. 2). 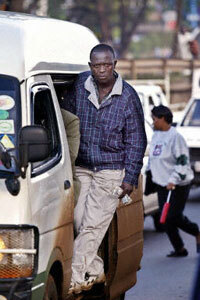 The Sunday Nation’s Philip Ochieng called it “a long overdue initiative to restore sanity to our roads” (Feb. 8).